The "Call" Blog and Email for Funeral Directors: The "Call": Want more cases right now? Then put your “Selection Room” and “Arrangement Room” in families’ mobile phones! The "Call": Want more cases right now? Then put your “Selection Room” and “Arrangement Room” in families’ mobile phones! Mobits can now put your "Selection Room" and "Arrangement Room" right on family member's mobile phones. Family members anywhere can use the mobile-app, Selection Rooms and Arrangement Rooms to view and purchase funeral and cremation packages, caskets, urns, vaults, flowers and gifts. Families in the process of choosing a funeral home are often heavily influenced by people not in the room with the funeral director. In effect, funeral directors often must 'sell' people they don't even see. Mobits funeral home mobile-apps give progressive funeral directors a distinct advantage over the competition in this situation. It allows you, the director, to close more families by taking your Selection Room and your Arrangement Room to each family member's mobile phone. So, if you don't close the family at your funeral home, you can still close the family at their home with your mobile app! 24 hours a day, seven days a week. 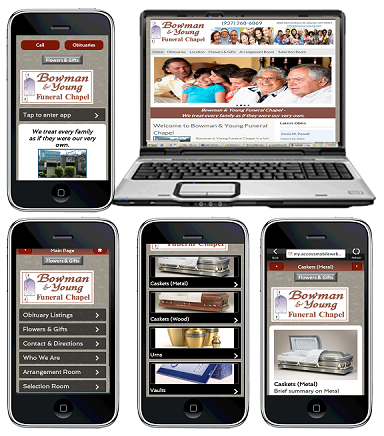 Using your mobile phone, take a look at Bowman Young Funeral Chapel in Dayton, OH. Here is a link to use from your mobile phone, http://bit.ly/1igMSPz. 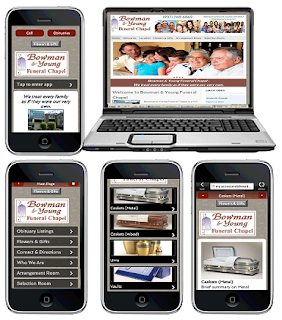 Or go to www.bowmanyoung.com on your mobile phone. Mr. Young now has the ability to have families check out all of his packages, caskets, urns and vaults on their mobile phones. Families can buy from their mobile phones. If one family member wants to buy the casket and another wants to buy the package, they can do so right from their mobile phones. His mobile app solves a lot of problems for him and makes him much more competitive. He is simply able to provide better service because all that he offers is easily accessible at all times from any mobile phone. If you ever deal with shoppers, and/or if you do arrangements at families' homes, you'll close more cases with a mobile-app that has your arrangement and selection rooms. And we'll even do this: If you sign on by March 31st to do a mobile-app with the "Arrangement Room" and "Selection Room," we'll set you apart from your competitors by giving you exclusivity for 12 months over a 20-mile radius! This means we won't sign up any other funeral homes in your immediate area, giving you ample opportunity to create a distinct advantage over your competition. This offer is good for one week only! So if you want to get on board, please call 786-763-1875.